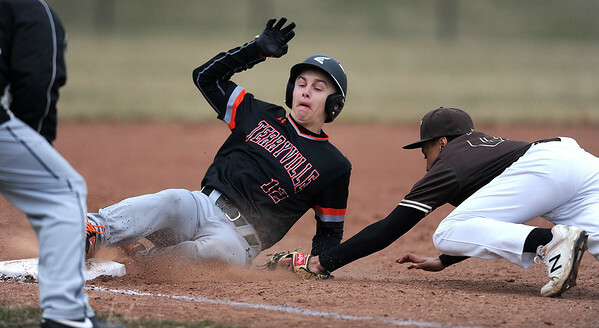 TERRYVILLE - The collective dejection could be felt brimming out of the Terryville baseball team’s dugout as it watched Colin Bamrick get caught in a late rundown between third base and home Thursday afternoon. The Kangaroos, on the wrong side of a 1-0 pitcher’s duel against Thomaston early on, had already squandered a pair of opportunities with a runner on third base in the third and fourth innings, and this situation seemed to be the latest disappointment waiting to happen with two outs in the bottom of the sixth. Bamrick stood on third and watched teammate Justin Carosone sprint to second on a delayed steal. Bamrick jogged halfway up the line as Thomaston catcher Alex Mentone fired to shortstop Drew Colavecchio, who caught the ball several feet in front of second base. With Bamrick caught in no-man’s land, Colavecchio ran at him, and Bamrick broke for home. Colavecchio’s throw was on time, but Bamrick’s head-first slide and swim move to the outside of the plate - aided on a drop by Mentone- was enough to set off a raucous Roos reaction as Bamrick tied the score at 1-1 that ultimately led to a 3-1 victory. Three pitches later, riding the momentous wave of the game-tying run, Anthony Pires smashed an RBI triple to right field to score Carosone. Terryville then plated an insurance run via an error on an infield popup, and Molina put runners on first and second in the seventh but closed the door to polish off a 3-1 victory. The late rally gave Molina a much-deserved victory, as the junior southpaw was in control with his four-pitch repertoire - four-seam fastball, changeup, slider, curveball - all day against the Bears (3-1). The only hiccup came in the first inning, as Molina walked the first two batters he faced before allowing an RBI groundout. He settled in nicely afterward, retiring 13 straight batters before putting runners on first and third in the fifth. He rung up his third and final strikeout to end the threat. The Kangaroos’ three-run sixth inning helped give Molina the win, and it made up for opportunities lost in the third and fourth frames. Colby Rheault reached third base in the third, but on a groundball in the hole between the shortstop and third base, Rheault did not break for home. Colavecchio made a diving stop and a terrific throw from his knees to gun Zack Rinkavage at first. In the fourth, the Kangaroos (2-2) put runners at second and third after Bamrick laced a single up the middle, and Pires pulled a hard-hit single to left. An error by left fielder Keegan Daigle advanced the runners, but Sean O’Donnell’s chopper back to pitcher Isaiah Johnson was fielded cleanly to end the inning. It was a bounce back win for Terryville, which lost 23-18 to Northwestern on April 3 and fell 15-2 to Shepaug Valley on Wednesday night. Posted in The Bristol Press, Terryville on Thursday, 11 April 2019 21:36. Updated: Thursday, 11 April 2019 21:38.